A tiny car from East Germany with an equally tiny 600cc two-stroke engine has to be one of the least likely machines to receive a full-blown racing makeover but one Bulgarian tuner thinks otherwise. 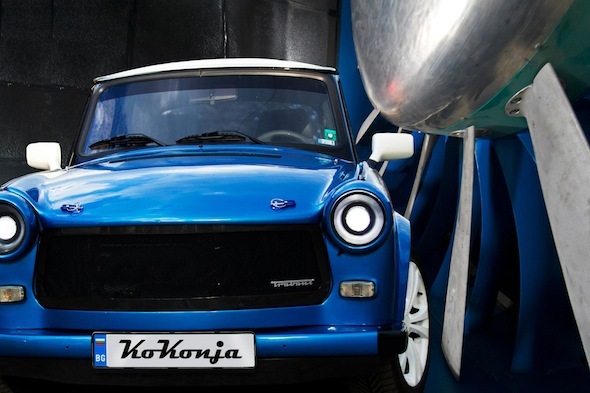 Kokonja is the Bulgaria-based automotive tinkering outfit that typically provides interior upgrades to private clients but the Trabant project was undertaken to show off the company's impressive talents and limitless imagination. An original Trabant has been stripped of its 26bhp engine - that previously took 21seconds to reach 62mph from a standstill and only managed a top speed of 70mph – and replaced with a more potent unit borrowed from a Fiat Coupe. The bodywork has also been suitably beefed up to match the more powerful engine with flared wheel arches, lowered suspension and chunky wheels finishing off the aggressive styling. Inside, the basic Trabant fit and finish has been overhauled with luxurious hand stitched leather on the seats and dash and the latest infotainment system bringing the 1960s car up to date. There is no word from the Bulgarian tuner on a price for the project or whether this thing will ever go on sale to the public (it is currently touring various tuning shows around Europe) but you can see it in action in the cool video below.